I can’t believe we’re already into the second month of 2013. Maybe it’s this busy schedule I’m on, maybe it’s the fact I’ve found my purpose and taking the steps to move towards it seems to be going at a rapid pace. I’m not sure what’s happening but more has developed in this discovery process of my life. As my business continues to grow, I’m looking for ways to make personal changes so that I can keep up with everything. I shared with you in last week’s post about the changes I’m working on to re-create myself into what I want next in my life. A very sensitive subject I didn’t touch on in my list is my physical appearance. I don’t have body issues with myself but as my business coach likes to remind me, “You only get one chance at a first impression.” Apparently, the way I dress has not caught up with where I truly am in my life and the direction of where my business is heading. Changes were suggested and recommended, many conversations were held and debated. Somewhere in all those discussions, I found myself surrounded by that ‘uncomfortable yet familiar’ feeling. My usual response? Questions, questions and more questions … do I have an expectation to be seen in a certain way? Why was I feeling so uncomfortable when these people were just trying to help me? What in the world was holding me back from going out and buying new clothes that fit me for work and my new life? 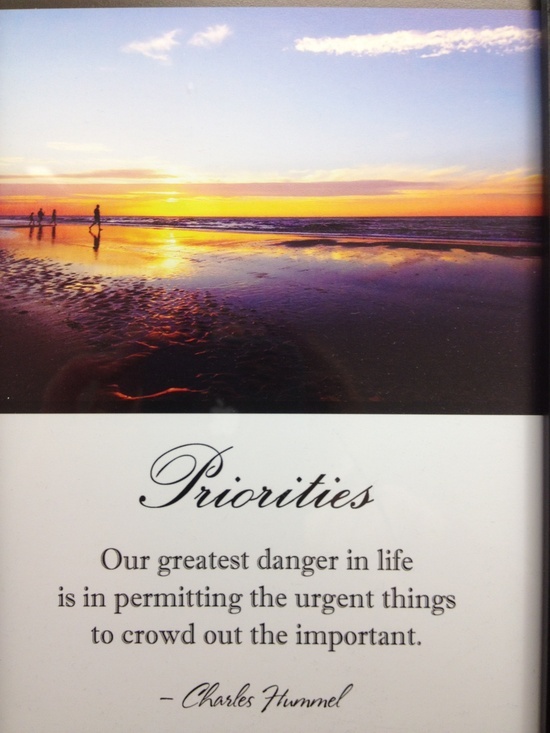 Then the big question rose its ugly head at me … why is it so hard for me to make myself a priority? Is this a ME Thing? A MOM thing or something that all women do? I started to look around to get some answers to my question, “Where does this feeling come from when these people have my best interest at heart?” They’re trying to help me and I kept shutting them down with excuse after excuse after excuse. Then I remembered this discovery process has something to do my continual search for my authentic self. I re-watched a recommended video of Brene Brown. If you haven’t seen this video, it’s truly worth 20 minutes of your time: click here to hear her empowering words. I’m always amazed when a messenger presents itself to me. The video viewing lead me to staring at the many, many self-help books on my bookshelf. One of the books reached out and spoke to me. It was one of those moments where I thought, there it is. There’s your answer. It is the devil in me… that is the only answer. I despise myself right now. Oh it ain’t that bad …. oh wait, what was that last photoshop post? Never mind, yeah it is …. Yeah what’s up with that? Guess everything has a purpose. SO, the message is be selfish. Actually, it sounds better the way you and Beattie said it. Some of the challenge could be from your role as a parent. However, I would guess it is probably an internal issue and only remotely related to your role as mom. No, I am not a psycologist. Just offering a thought here. Anyway, Part of what both these philosophers seems to be saying is to be comfortable with yourself. Its like I don’t think twice about doing something for my son, but I’ll keep putting off the things I should be doing for me. What I got from the reading was that its ok for me to be selfish if its for the sake of helping me to keep growing and moving forward. I think the uncomfortable feeling comes from making changes. Do it – BE SELFISH! Be okay with making changes. Wouldn’t you say thesre are two different challenges – though very possibly related. I think you’re right about that. I think they’re connected but each has its own special challenges. The trick is to find a way to make them work together. Please dilligently answer them and then be my guide. Cool. I’m going to hold you to it. You ought to know me by now. great post. If we want to be who we are, first we have to know who we are. It is really helpful to sometimes invite yourself for a cup of coffee and get to know yourself more. Thanks for the comment. I think that’s what this blog has been helping me do – figure out who I really am. I’ve realized quite a bit about myself this past year that I wouldn’t have dreamed I’d do if you met me a few years ago. I honestly believe it’s part of being a woman. We are nurturers with everyone but ourselves. Even if you have to make a list and put your name at the top as a reminder. I’m guilty of the same thing. I agree. My girlfriends can relate to this much easier than men do. It’s about changing the way I think about things. It’s funny, when I’m making these excuses and saying ‘do you think so?’ I don’t even realize I’m doing it until my friend says, ‘YES stop asking me that!’ That’s like years of repressed thinking just coming out. Well have fun shopping! DO you know what your style is? I have not really narrowed down my style OR gotten my body as fit as it needs to be for the lifestyle I want to live! I started going onto pinterest and pulling any looks I liked then I’ve been narrowing down the looks I like the best. BUT like ALL things I still don’t know EXACTLY what I want. It’s a PROCESS! Weird thing is, I LOVE shopping! I just don’t make the time to do this for myself. I’m working on my style in Pinterest too. Have you seen my board? I’ll go check out yours and see if I can figure out your style or where you should be heading. I also watch episodes of “what not to wear” to give me ideas of my options. Ever seen that show? I like that show too! I don’t have a board I have a folder on my desk top! I guess I would have more fun shopping if I had money and I was slimmer… I’m working on the slimmer part!!! Good Luck I’ll check out your boards! I miss talking to you! Well girl you go get your coin and remember us poppers!!! Much love darlin! !